Fuel Your Body Appropriately: Stop the Madness! What kind of relationship do you have with food? Is it healthy or unhealthy? My family and I just got back from an amazing week in Nashville with great friends. We went to the CrossFit Central Regional and witnessed some very fit adults compete all weekend and do some very fit things. The top 5 athletes (men, women, and team) punched their ticket to the next level, The CrossFit Games in Madison, WI. It was very motivating and fueled my fire to continue to train hard for my own goals. This last week was not all fun and games, however, as I sat in the hospital room with my very sick father on Tuesday and Wednesday, who is awaiting a major heart surgery. He was supposed to have surgery this admission, but unfortunately, his blood sugar is way too high and they couldn’t safely do the surgery and provide a positive prognosis for his outcome. So, now, he has to go back home and get his blood sugar under control before he can have the surgery that will ultimately save his life. These athletes and my father are on opposite sides of the spectrum. The athletes are trying to be as fit as possible, while my father is trying to maintain some quality of life. What they have in common is nutrition plays a huge role in their goals. In the United States, we have access to more food in a day than people in other countries might see in a month, even a year. We walk into a gas station and candy bars are staring us in the face, sodas are on the end aisle, and Little Debbies scream our name. There is a fast food restaurant on every street corner and a rainbow colored Frappuccino the size of a small dog. Social gatherings and family get-togethers are centered around food! With all of this access, no wonder we are facing an obesity epidemic in this country. And there IS an epidemic. Am I saying don’t enjoy food? NO, that isn’t what I am saying at all. What I AM saying is, on a regular daily basis, put food in your mouth that will support your goals and promote health and well-being. This will look different for everyone. What the CrossFit athlete can and needs to eat to perform at the top of their sport will look much different than what my father needs to eat in order maintain quality of life. 1. Realize where you are on the spectrum – what I mean by this is, if you are an athlete, you are fueling your body for performance. You can eat quality foods most of the time and indulge every once in a while with no issue. If you are suffering from a chronic illness, those indulgences can be detrimental. You won’t have the same luxuries as the athlete. 2. Be an example – as a parent, our children mimic us. 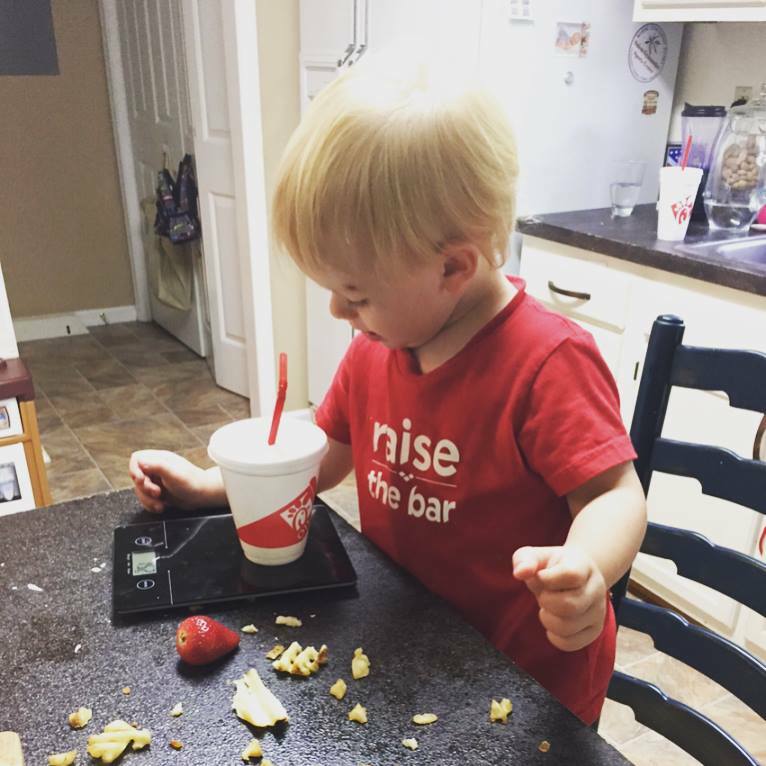 Drew just recently posted a picture on Instagram of Rock weighing his strawberry. They are watching and we can teach them so much. Providing our children with quality food is step 1. Teaching them about quality food and how to prepare it is step 2. Showing them how to exercise self-control when we do indulge is step 3. They will carry what we teach them into their adult life. 3. Exercise self-control – when we do indulge, maybe get the Like It size at Coldstone rather than the Gotta Have it. Put it in a cup rather than a cone. Eat two slices of pizza rather than a whole one by yourself. This list can go on. 4. Exercise! – obviously athletes will exercise. It is part of their sport. I’m talking to my kids and my average adults. Get moving!!! 41-year old Army wife and Mom to a genetic 13-year-old freak. Basketball player turned runner turned CrossFitter turned powerlifter. Crystal has podiumed over the years at 5k and 10k road races and local CrossFit competitions. She is currently a 72k USAPL National Level powerlifter. Her best competition lifts are 145k squat, 77.5k bench, and 170k deadlift. She is an RN with a Masters degree in Nursing Education, a CrossFit affiliate owner, and a Mash Elite Performance coach. She has several years of coaching experience in the CrossFit community and is a life long learner of the art and science of the vast strength and conditioning world. She is currently studying for her CSCS.